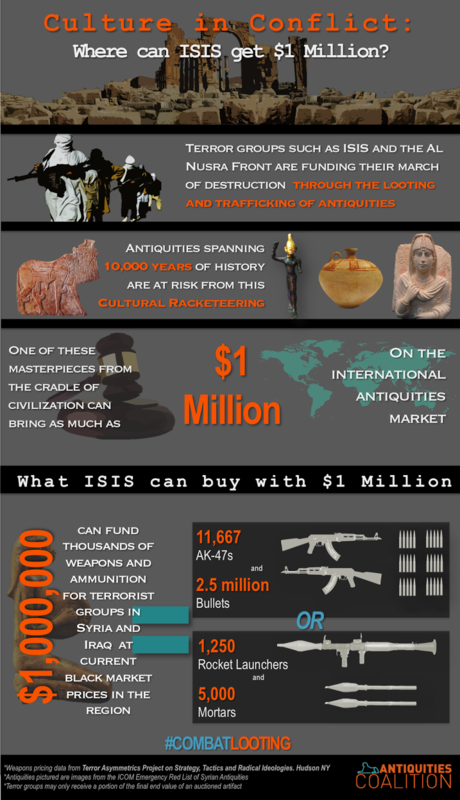 Antiquities Coalition : Culture in Conflict: Where can ISIS get $1 Million? With the rise of the Islamic State in Iraq and Syria (ISIS), the world rightfully asked how a militant faction too extreme for Al-Qaeda transformed itself into “the world’s richest terror group ever.” ISIS boasts an annual budget worth $2 billion and a war chest of $250 million, which if true surpasses the Taliban’s (and that of many states). Still more troubling, it is now financially self sufficient, and no longer dependent on foreign donors. How? Like organized criminal enterprises before it: extortion, ransom, robbery, and smuggling. It perhaps comes as no shock that it has been trafficking arms, drugs, and even oil. However, the public reacted with surprise to reports in June 2014 that ISIS jihadists had earned “millions” by looting the region’s archaeological sites, and then selling its ancient treasures to the highest bidder. It shouldn’t have. Archaeologists, criminologists, law enforcement agents, and military officials have long warned that the illicit antiquities trade is funding crime and conflict around the world. However, under ISIS’ black flag, this looting and trafficking is not just a side enterprise, but a massive illegal industry. The United Nations recently confirmed the connection between cultural racketeering and terrorist financing. On February 12, 2015, in a binding and unanimous resolution, the Security Council recognized that ISIS, the Al-Nusrah Front, and other groups associated with Al-Qaida are indeed funding themselves through “the looting and smuggling of cultural heritage items from archaeological sites, museums, libraries, archives, and other sites.” These earnings are “being used to support their recruitment efforts and strengthen their operational capability to organize and carry out terrorist attacks.” Resolution 2199 put this cultural racketeering on par with profits raised from oil and ransoms, and further ordered all Member States to “take appropriate steps to prevent” the illicit trade immediately. That same week, the Wall Street Journal reported that looters were hawking Bronze Age busts from ISIS-controlled territory for $30,000 USD, a price since confirmed to us by archaeologists monitoring the black market for such artifacts. Then the very next week, an undercover investigation by the BBC warned that a single masterpiece from war-torn Iraq or Syria could fetch a whopping $1 million on the international market. That figure came out of extensive interviews with proclaimed smugglers, “go-betweens,” and dealers involved in the blood antiquities trade. No one knows just how much money ISIS is making on antiquities looting and trafficking — except, perhaps, ISIS — but even the most conservative estimates have grave implications for security in the region. And thus around the world. Current weapons costs for Iraq and Syria, as provided by the Terror Asymmetrics Project (TAPSTRI), demonstrate that $1 million would fund either 11,667 AK-47s with 2.5 million bullets or 1,250 rocket launchers with 5,000 mortars. Put another way, if ISIS were to reap the profits from just one of the sales reported by the BBC, it could literally arm an army. With these numbers, it is no wonder the United Nations has prioritized cutting off this critical source of terrorist financing, as should we all. The stakes are high. If we fail, the sites and objects that tell the very story of civilization may well be converted into weapons and troops, which seize cities, slaughter soldiers, and behead civilians.